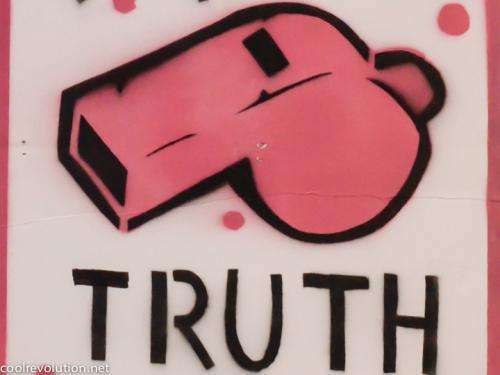 Whistleblowing performs a public service that is celebrated in the media, condoned by the public, and increasingly protected by the government. So why are we so reluctant to do it? Recent research we published in the Journal of Theoretical Biology suggests the opposing tendency to complicity may have roots in our evolutionary past. Of course, humans (and many other species) benefit from duplicating the actions of those around us. But what of the cases when we discover that the actions of others are wrong? If the goal is to capitalise on this information, then you should expect that we immediately update our behaviour with the correct information and that the rest of the group will follow. This is what we find across many species, with one notable exception: humans. As a species we insist on sticking with what we have been told despite knowing its wrong. Humans use error-prone gossip to dictate their actions, even when accurate information is freely available. Most explanations for this depend on various kinds of limits to our rational abilities. Several argue that since the fidelity of human social information is superior to other species, it is a beneficial heuristic (essentially using intelligent guesswork rather than a formula to work something out) to stick with it longer than for other species. The implication is that if our cognitive performance was better, we would figure out when to ignore social information. However, our research at the University of Bath suggests another, much simpler explanation. Far from being maladaptive, choosing complicity instead of whistleblowing may often be the most advantageous option for both the individual and the group. This is because the reform the whistleblowing requires cannot happen group-wide in one fell swoop. The disruption caused both to the individual and group by attempting the reform may outweigh the benefits. As computer scientists, we used modelling to create a virtual society of individuals that depended on co-operation. We then introduced bad practice into the society and observed the results. Individuals and groups that were aware of the bad practice, but ignored it, repeatedly performed better than those that blew the whistle. This effect was so strong that even in a society composed entirely of honest whistleblowers the introduction of just one "company man" inevitably resulted in the complicit behaviour spreading like a virus to the whole society. Of course, these results in no way suggest that such complicit behaviour is justified. Our first allegiance is to justice, but in evolutionary terms national law is a comparatively recent development. In this respect, the situation resembles an explanation for the difficulties we experience in dieting – we struggle with a metabolism that is optimised to store fat in response to the demanding environment in which we evolved. Here we struggle to willingly cause disruption to group co-operation, since we evolved in a context where the ability to achieve such co-operation may have provided the overriding advantage. If, in our evolutionary past, a co-operative society was more advantageous than a just society, there would be little surprise in our hesitation to blow the whistle. Furthermore, many whistleblowers end up unheard or are punished for their actions, which can only serve to reinforce this hesitation. Current thinking focuses on providing external inducements to potential whistleblowers. But if our research is correct this may be counter-productive and simply result in increased stress levels for employees. A better alternative may be to focus on the company ethos. If an organisation's policy can be reformulated so that whistleblowing is regarded internally as an act of loyalty, then it will no longer contradict the evolutionary urge to be co-operative. More information: Paul Rauwolf, Dominic Mitchell, Joanna J. Bryson, "Value homophily benefits cooperation but motivates employing incorrect social information," Journal of Theoretical Biology, Volume 367, 21 February 2015, Pages 246-261, ISSN 0022-5193, dx.doi.org/10.1016/j.jtbi.2014.11.023. "However, our research at the University of Bath suggests another, much simpler explanation. Far from being maladaptive, choosing complicity instead of whistleblowing may often be the most advantageous option for both the individual and the group. This is because the reform the whistleblowing requires cannot happen group-wide in one fell swoop. The disruption caused both to the individual and group by attempting the reform may outweigh the benefits." This is why we are doomed. Our political, social and cultural systems are all fatally flawed but the disruption caused by stopping, reworking and implementing new workable systems would be catastrophic. But we need to stop, reset, reboot in order to have sustainable systems. The years of patching up inherently flawed and quickly outdated systems has resulted in ones that don't work and cannot be repaired,as most of them are fundamentally flawed (such as the way we practice capitalism). So let's sit back and wait for the fireworks. If the 'group' the individual identifies with includes the wider society then the benefit of whistle blowing may outweigh the costs, but if the individual only identifies with colleagues or the workplace then the cost does not outweigh the benefit. The same goes for those who agree with their country's errors or illegal acts. Those who identify with a global community are far more likely to oppose such behaviour and even give evidence against their country to international bodies. In other words, the same (conscious) dynamic applies to all individuals, but the group that the individual primarily identifies with is the variable that predicts behaviour in this regard (whistleblowing). It is suggested that: "A Tendency to follow the herd rather than whistleblow may be part of our evolutionary past"
"Far from being maladaptive, choosing complicity instead of whistleblowing may often be the most advantageous option for both the individual and the group." Could explain why evolution itself has become concensus science! lol! This idea could undermine every scientific discovery that has ever been made. I mean, how would you ever know if the errors/problems are not reported. Everything comes out looking hunky dory! I can think of other reasons we don't blow the whistle. It might hurt our career. It might give us a reputation for not being a "team player", etc. In other words, much, if not all of our behavior is self-motivated. We are basically self-centered individuals. Even when we do "good" things, it is sometimes for selfish motives. To be a "whistleblower", you have to be a member of a group or organization. If you're on the inside of this group, you have some particular affinity towards it -monetary compensation, community, support, political alignment, etc.. Therefore, your well-being is tied in some way to the perception or performance of the group. "Whistleblowing" is likely to negatively impact the group to-which you belong, causing political, social, or economic repercussions. These repercussions will will harm the people and organization with which you have a personal and emotional bond and association. This will result in being alienated from your group for a perceived betrayal, while not being accepted and embraced by the larger society for your relationship with the group. Thus, its generally a "lose-lose" scenario for social animals like ourselves, and why whistleblowing typically has to include protections and generous compensation. cjn explained it better than I did. The reason why people are afraid to blow the whistle might be totally unrelated to evolution. The attempt to explain everything in evolutionary terms simply gives evo-devo "scientists" eternal job security, but is it real science? It's a cushy job. No one can really prove you wrong. But the thing is, there's no guarantee the explanation is correct, even if it makes sense w/in the evolutionary paradigm. Things can make sense & sound plausible, yet still be wrong. All these guys need for their job is to have a vivid imagination. As I said before, there may be other perfectly valid reasons a person may choose not to be a whistleblower and it could be totally unrelated to evolution, even if the evo devo guys claim it makes sense evolutionarily. The prob with evo devo is they can't show that their explanation is the real reason for the action they seek to explain. They just assume an evolutionary reason exists.